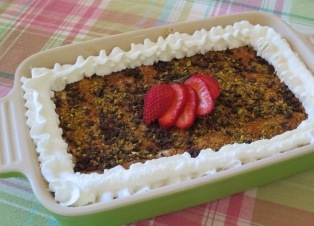 Dolci di Cucchiaio, meaning spoon desserts, is a collective term for puddings, gelatins, custards, flans, and other desserts eaten with a spoon. Frozen desserts are not in this category. Bianco Mangiare is an eggless milk pudding dessert that is made with all white ingredients; thus the name biancomangiare, literally white food. Made with milk and cream and flavored with vanilla and almond, biancomangiare is very similar to panna cotta. Bread pudding is a baked dessert that combines bite-size cubes of bread with a rich custard mixture of cream, eggs, and sugar with fruit and/or spices added. 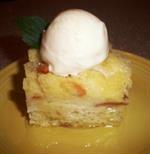 When you add the Italian liqueur, Limoncello, to bread pudding you have a moist and delicious, lemon-flavored gourmet dessert. 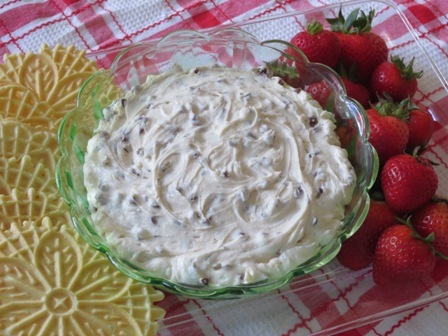 The classic coeur a la creme is made in a special mold. 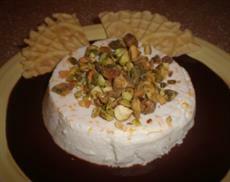 Our recipe substitutes ricotta and mascarpone for the standard cream cheese. Panna Cotta is a soft, creamy, eggless custard whose name literally means ‘cooked cream.’ It is easy to prepare and is a blank slate for many added flavors. 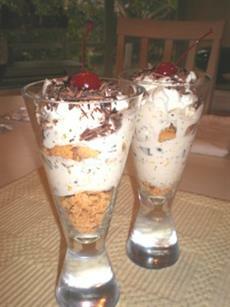 A parfait is a cold dessert which can be made with ice cream, sorbet, gelato, granita, fruit, syrup, liqueurs, whipped cream, flavored gelatin, yogurt, with cruched cookies or nuts arranged in layers and served in a tall, clear glass. 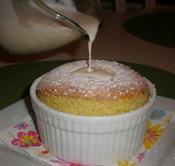 This recipe for pistachio soufflé is served with crème anglaise. 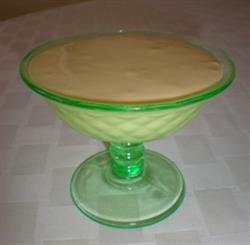 Crème anglaise is a light custard often used as a sauce. 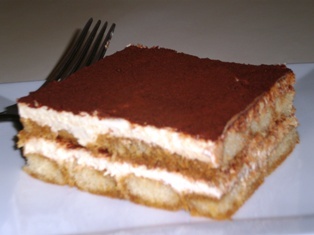 Tiramisu is a wonderful Italian dessert made with mascarpone cheese, delicate ladyfingers (Savoiardi), and laced with strong espresso coffee and Marsala wine. This Sicilian watermelon recipe brings out the full flavor of the melon in a light pudding-style dessert. Zabaglione (pronounced tsah-bah-YOH-neh) (and also written sabayon, zabajone, and zabaione) is an Italian dessert made from whipped egg yolks, Marsala wine, and sugar. These little chocolate cups can be filled with fruit, mousse, custard, or even peanut butter. Melt bittersweet chocolate and use a small pastry brush to paint the chocolate inside silicone baking cups. Refrigerate until set, about 10 minutes. Repeat brushing on additional layers and chilling until they are the thickness you desire. When firm, peel off the cup and fill. Use a pastry bag fitted with a star tip to pipe in the filling. Smooth, rich and satisfying, each of these delectable dessert sauces deliver all new levels of deliciousness for exciting dessert possibilities.Drizzle a spoonful over ice cream, pound cake, cream puffs or sliced bananas. Add a dollop to a cup of coffee or pour some over French toast and waffles to wake up a traditional breakfast. 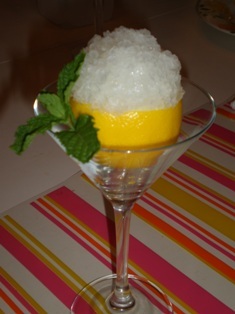 Serve Limoncello Granita in a hollowed out lemon garnished with a sprig of mint. Combine the sugar and water in a saucepan. Bring to a boil. Cook the mixture until the sugar dissolves. Remove from the heat. Stir in the Limoncello and lemon juice. Cool to room temperature. Follow instructions for freezing granita. Classic Italian Rainbow Cakes are made in Long Island, NY. They combine Almond Flavored Cake with Rich Dark Chocolate Coating, Chocolate Sprinkles, Raspberry Coating, and Raspberry Jelly. In this bread pudding recipe, the bread is a traditional Italian holiday bread, panettone, that is baked with a creamy pumpkin and spice-flavored custard. Rice pudding is true comfort food ... sweet and creamy, this is a simple recipe to make with just a few ingredients. This delicious and easy plum crisp recipe is made with slices of ripe plums and a crisp and crunchy topping made with flour, oatmeal, almonds, brown sugar, butter, and cinnamon.